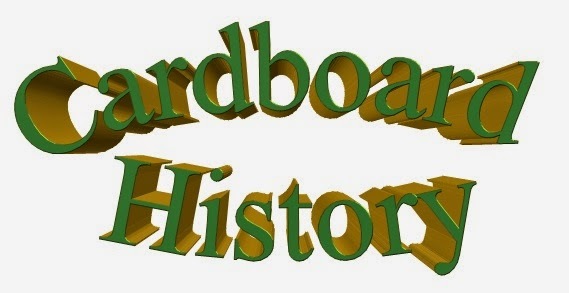 Cardboard History : What if....I wrote other bloggers' series? Most bloggers who are fairly active posters have regular series they run...I am no different, with Uniform History, NBA Encyclopedia, Sets in My Collection, Box Break Review and others (not to mention the ones I have planned but have not begun yet! )...but I had a fun, unique thought....what would it be like if I had been the one to originate and post in other bloggers' series? Completing sets used to be my thing. There is not much that brings joy like finally completing a set that I've been working on forever, or what feels like forever. Here's a concept I used to do but gave up on a while ago. I used to use PhotoScape to put together a poster-like image of an entire set. It had some drawbacks- horizontal cards got squeezed to fit, as can be seen in the next to last two rows here- and making these files was not easy- they are really big. So big that larger series cause the system to lock up, in fact. But it shows the complete set all at one time! I put together 37 of these "posters" before I moved on to something less difficult. One of the sets I've completed runs 659 cards, so I wouldn't be able to make a poster for them. Gavin's Baseball Card Breakdown was one of the first blogs I ever read- in fact, I think it was the first one I ever read- so he gets the lead off tribute spot in this post. A few weeks before Christmas my mom actually found a PressTine repack at our local dollar store...something that has never been done before, despite the fact that we go there often. It contained 8 cards, of which two were actually new. When my collection is as large as it is, getting two out of 8 new is actually really good odds. 2004-05 Upper Deck Sweet Shot Jason Kapono, a set I hadn't added to since it was new. Unfortunately I don't remember the duplicates that came out of it, I don't remember duplicates very often. Douglas's adventures with his repacks have left me jealous more than a few times, considering we normally don't have anything like that around here. Back in July he sent me a bunch of his duplicates/rejects and I sent him all the Raptors and Grizzlies I had available. Living vicariously through cards! One of the more interesting concepts out there is Nick's Short Term Stops series. It highlights players by team who spent only a short time with that team. This is a concept that bears further exploring in the NBA, so for this segment I will highlight just one card. Don't be too surprised if I eventually adapt this to the NBA somehow, probably seasonally-based instead of team based. I always planned to take a look at this, but didn't have enough scanned or well-documented enough to do it, and I am getting closer but still not there. Look for me to return to this concept in a couple of years. Ageless Joe Johnson has been in the NBA since 2001, and is still going strong with the Utah Jazz. He may be the most under-rated active player of the past 15 years in fact. 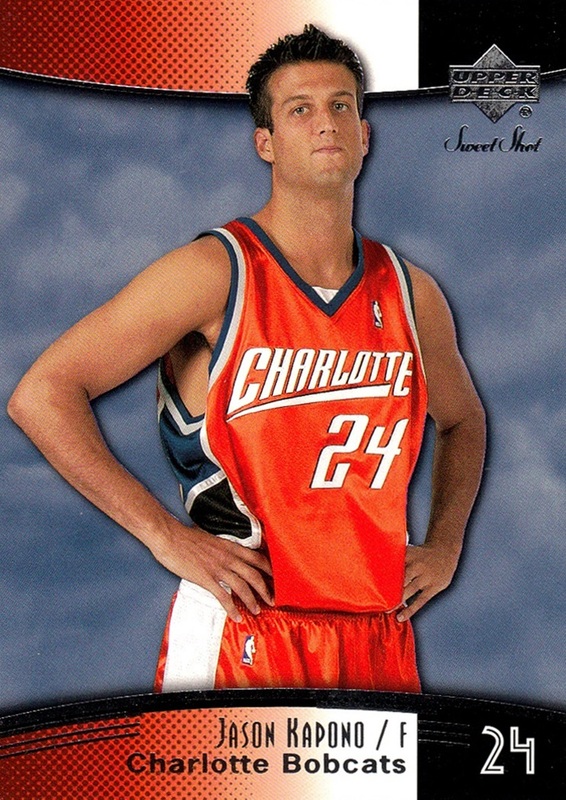 He started with Boston, and was traded to Phoenix halfway through his first season, 2001-02. He played many years with the Suns, before joining the Hawks for several more years. (almost half his career was with the Hawks) He was traded to the Brooklyn Nets at the start of 2012-13 and was a member of the Nets until late 2015-16, when he was bought out. He was the best player on the Nets the entire time he was there, and when they got rid of him is when they reverted to being the laughingstock team that has no real chance of winning anything any time soon. For the tail end of the 2015-16 season, he joined the Miami Heat. Only 24 of his 1240 career games (at the time of this writing) came with the Heat. He moved on to the Utah Jazz after that season where he plays today. The only set that both shows and lists him with the Heat is 2015-16 Excalibur. 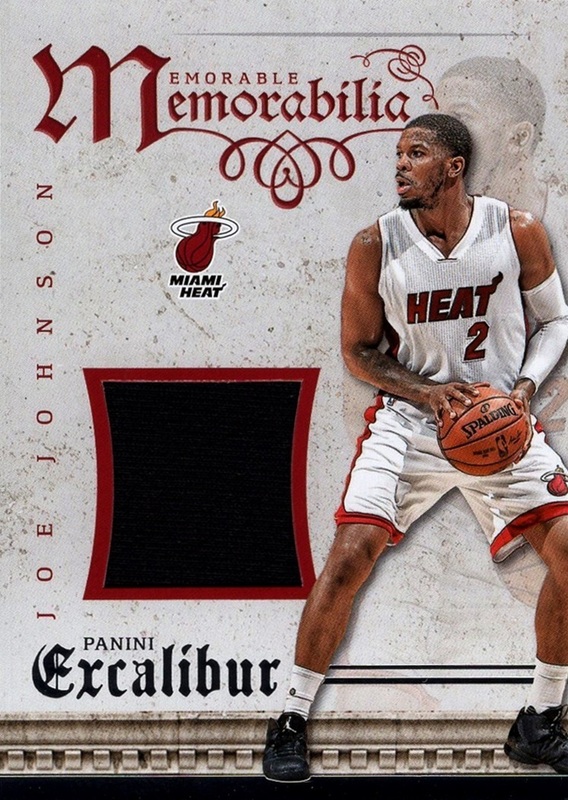 For a player who has been the backbone of pretty much every team he's been on his entire career, which is not showing any signs of slowing down, his brief time with the Heat is just a drop in the bucket, rare to see on cards. Update: I wrote this in January, Since then, Utah traded him to the Sacramento Kings, where he didn't ever play, nor was he intended to, as he was part of the deal for salary reasons. He has since signed with the Houston Rockets and will be coming off the bench during their playoff run, which they expect to be champions, as they had the best record all season. Only time will tell if that is the case, or if he gets any cards as a member of the Rockets. Robert, like myself, is addicted to serially numbered cards. 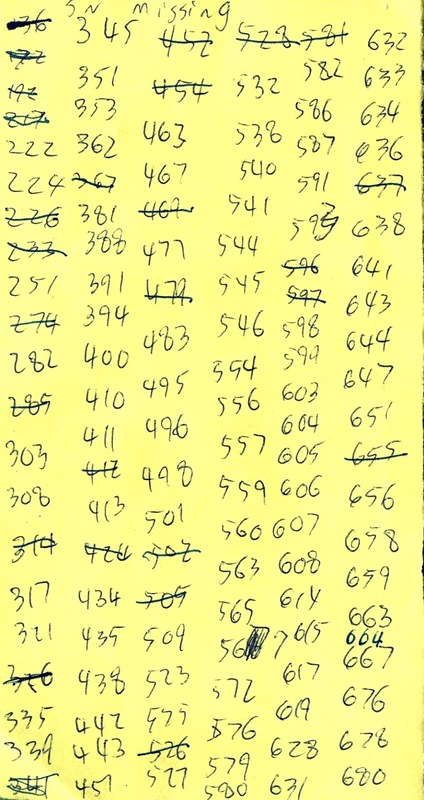 His project called "Serial Numbered Insanity" was getting one card of every serial number to make up a 700 card set for baseball. 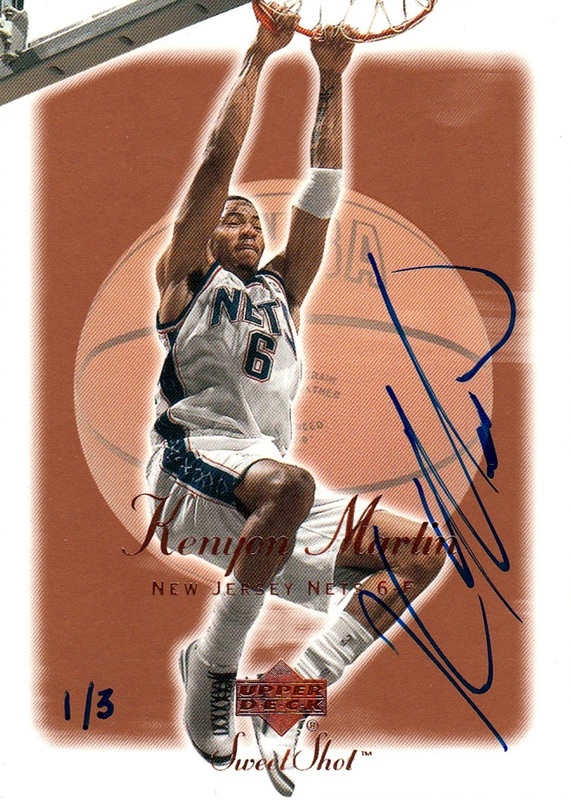 I've sort of done something like that for the NBA, which I accomplished mostly before I knew what a blog was...but I've gotten as many different serial numbered cards as I could possibly get. And I made a chart of which numbers were missing to have an uninterrupted run of 1/whatever, 2/whatever, etc. I wrote out as many numbers missing on the piece of paper I had handy, which could only fit up to #680, but there's lots more missing the higher you go. I am not exactly sure when I wrote out this paper, as I didn't think to date it, but based on some of the numbers I've crossed off, it had to be in 2014. The numbers shown are what I'm missing... ie 400/1999, or 557/2500, etc....those crossed out are ones I've gotten since I made the chart. Adding other sports to that list, I can say I have these numbers as well. 222, 317, 339, 394, 400, 532, 545, 560, 615, 678. The two in the 600s come from the NHL, the rest come from NASCAR. That's the only other place where I've built up a pretty decent sized collection, but my lowest missing number there is 41! I'm not missing any more numbers until 76, there. Now that I'm collecting the NHL full time, some day I will be able to do this with that sport as well, I hope. 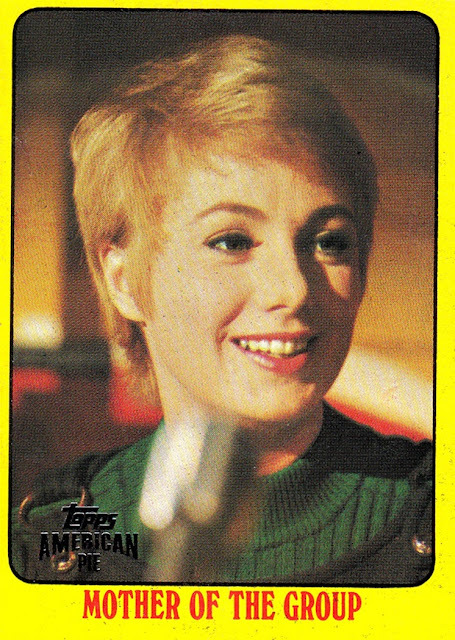 I have collected over 4000 serially numbered cards since 1997, when I got my first. I added more than 300 in 2017, the first and only year I documented how many new ones I got in a year. I am documenting that again this year, and at the time of this writing, I've already added 54 new SN cards to my collection- mostly thanks to sorting COMC by SN>lowest priced first and then picking off as many cheap ones as I can, although some have been pulled from packs as well. One of my better pulls in my lifetime, this autographed buyback numbered 1 of 3 came out of a packbox of 2002-03 Upper Deck Ultimate Collection. Until very recently, Kenyon Martin was tied for the lead with most autographs in my collection with Shawn Marion, but Elton Brand has since moved past them into 1st. These two came from 2011 Topps American Pie. The Partridge Family card came from the hobby box I did, and the A-Team came from a blaster. My hobby box of 2013 Topps 75th Anniversary gave up this 1991 Desert Storm buyback- and I couldn't be more pleased. This set is one of the main Non-Sports sets of my youth, and would be the first historical cards in my collection...although it would take more more than a decade to appreciate that fact. I've been meaning to pick up a few more buybacks and in fact have a few in my COMC waiting to ship...but for now, this is my entire buyback collection. It appears that they issued buybacks for 75 different sets in the 75th Anniversary set-makes sense- which I would not mind working on as a set in itself someday. The buybacks I have in COMC are all NBA though, I think. Sorry the scan is not so great on the Desert Storm card. The scanner I was using then was not good for some cards. One other thing I want to add- Shane's Buyback posts inspired me in another way. I do the NBA Encyclopedia in 10 card installments, because I feel that's the ideal size of a post, and I can fit all 10 people into the Label section. Plus, writing up the 10 little bios would possibly get tedious if I did more than 10...my original plan was to have 1 post per person. At my current rate of posting, that would take me oh, 1000 years or so. Doing 10 people at a time means I might finish it in my lifetime...I plan to get back to it soon, by the way. Man, Night Owl is a tough act to follow. The most popular card blog by a wide margin, he has several series he runs - the only blogger with more regular series than I have, I think- and they are all good. But, because I know I have cards I can use for it, I'm going to run with Awesome Night Cards. Night cards for the NBA and NHL are tough. 90% or more games are held at night. But...indoors. With lights so bright you have no idea it's actually pitch black outside. So, where does that leave me? My one sport that doesn't compete indoors...because the exhaust fumes would kill everybody. Literally. NASCAR! NASCAR used to have only two races at night when I was a kid. They were special. You looked forward to them all year long because you knew when the sun went down at Bristol, it was going to be a wild evening, one of the best races on the schedule. When you try to cram 43 cars onto a track .533 miles in lenth, there is going to be contact. It's unavoidable! Eventually, it went the other way around, and almost every single race was held at night for a while. It wasn't good. Especially as they tried it at tracks too big for lighting, and there would be gaps between the lights where it was darker. The TV broadcasters had difficulty seeing the cars when they were on the other side of the track, even. I had difficulty seeing the cars even when they were in front of the camera. They've kind of gone back the other way, but the Bristol Night Race endures. One of the most memorable was the 1995 race. Terry Labonte and Dale Earnhardt were having a duel for the race win, and Earnhardt couldn't get by Labonte...so he tried to go through him. Terry bounced off the #31 car and then went nose first into the wall. However, since this was the final lap, he was able to slide across the finish line first, and won the race. Something similar would happen in 1999, but Earnhardt made sure Terry couldn't win that one, turning him backwards into the wall, a controversial finish that is still talked about- and shown in replay- to this day. 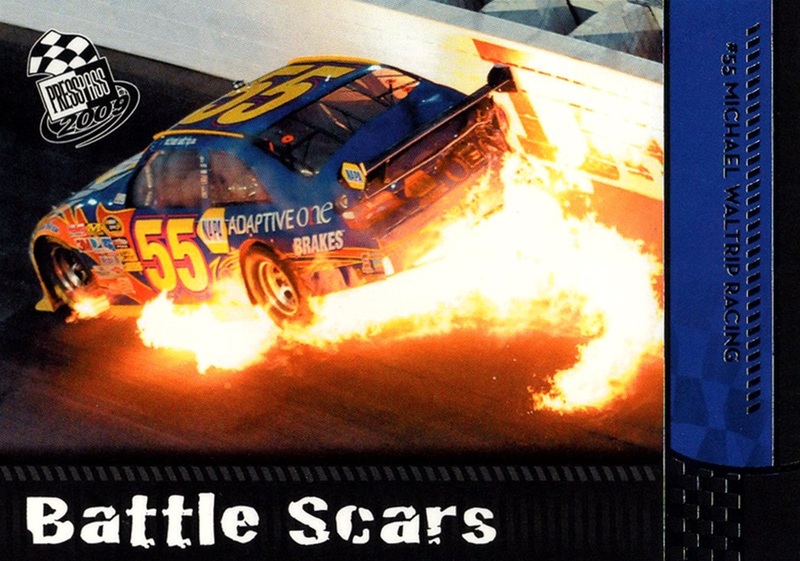 However, while both of those races do appear on cards, I've chosen to highlight a different one, not from Bristol, because it has the most impressive night-time shot on a card I've seen. This was a bad night for Michael Waltrip. It occurred in Darlington, South Carolina in 2008. 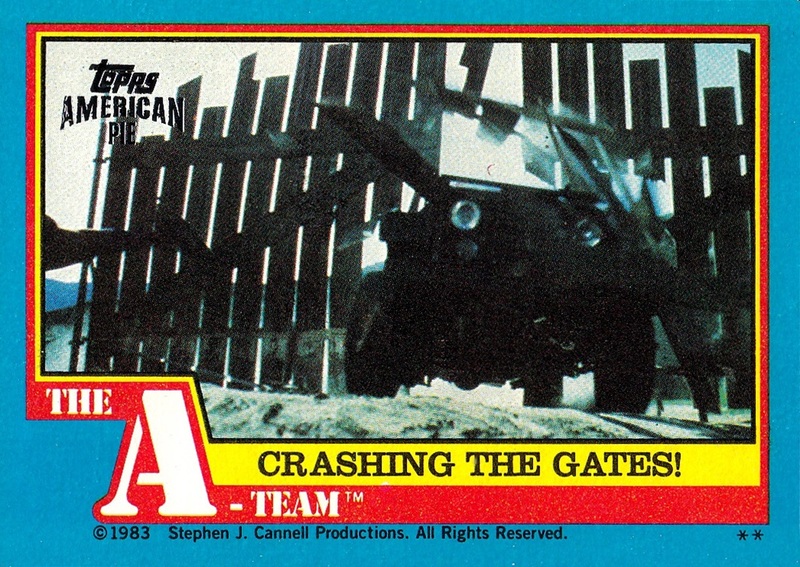 A wreck put him into the wall and smashed the oil system, which of course sprayed hot oil all over the engine...and immediately burst into flames. The oil fires like this tend to flame out quickly, and Waltrip was unhurt, but it makes for one very interesting- and rare- card photo. 2009 Press Pass is the only NASCAR set to dedicate a subset to crashes...in 30 years of card issuance for the sport. A most impressive night card! It's definitely something I plan to work on in the future. I need to get more scanned first. I was thinking the same thing. Thought it would make a good Blog Bat Around. That night card is AWESOME! I've loved that image since I first got the card when it was new. One of my favorites overall actually. I'm with Mark on this, a short term stops for the NBA would be fun to read about. I hope to get enough scanned so I can start it by 2020! Great idea for a post. I love completing sets....I actually don't particularly get excited with short-print, auto, or memorabilia cards. I know, I know, but completing sets is at the heart of where I started collecting. 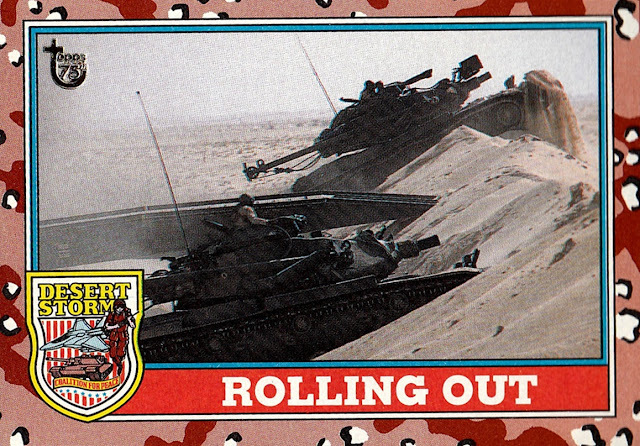 I love that battle scars card! I am a set builder at heart myself. I have moved away from it in recent years due to the sub-par sets being issued now, but it's what I always want to do, and my collection is all documented by set. Good stuff! Thanks for the shoutout, but I can't take the credit for "Joy of A Completed Set" as I believe that originated with the Cardboard Junkie blog and eventually became a title that lots of blogs used to feature a recently-completed set, though maybe I'm the only one that still does it much anymore, so it's now becoming associated with my blog. Most of his posting was before I discovered card blogs...he's on my blogroll but it's you I associate it with. Great concept for a post. 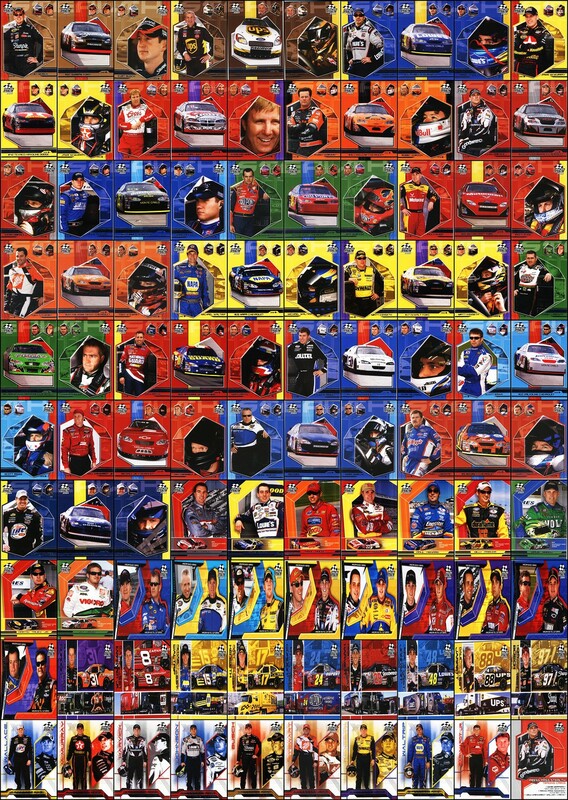 I love looking at those set mosaic pictures (even if some of the images get squished a bit), and boy is that a fantastic NASCAR card! Thank you! I have all 30-something I did on my website here: http://public.fotki.com/ElCaminoBilly/trading-cards/completed-sets/ (sorry, don't remember how to make a clickable link). I will see if I can work in a few more onto here as well. Great post. I hope to see more of these down the road. Oh man.... that's one heck of a night card! It's so cool...or maybe hot...hah! I'm a little late to the party here, but I too thought that this was a really fun post.